Danish-Dutch quantum research will get a new impulse. At the official opening of the “Villum Centre of Excellence for the Mathematics of Quantum Theory” (QMATH) in Copenhagen a Memorandum of Understanding has been signed by research centers QuSoft and QMATH. 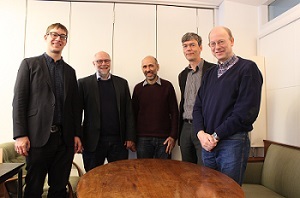 The MOU was signed by Harry Buhrman and Kareljan Schoutens (directors of QuSoft) and Jan Philip Solovej, Matthias Chrisdtandl, and Bergfinnur Durhuus (Center Leaders of QMATH). QuSoft and QMATH share the common vision of understanding information at the quantum level and harnessing it for superior computation and communication. Over the past years –long before the founding of QuSoft and QUMATH- researchers of both centers have already been working together in a natural way. The similarity in research topics and shared research goals offered a common ground for a close collaboration. The interaction has been accelerated through exchange of students and researchers. By signing this MOU both parties want to put the partnership and excellent relation between QuSoft and QMATH on firmer ground. By doing so QuSoft and QMATH agreed to exchange staff and students, to organize joint scientific meetings and to acquire joint projects with EU funding. QuSoft and QMATH belief that research and education within quantum information and communication will benefit from the formalization of their collaboration. The Villum Centre for the Mathematics of Quantum Theory – is a new Danish research center with the goal to contribute to our mathematical understanding of quantum physics with special emphasis on the interplay between quantum matter and quantum information. The research is motivated by the surprising informational aspects of quantum physics with its potential use in quantum communication and long term prospect of building a quantum computer. The centre is hosted by the Department of Mathematical Sciences at University of Copenhagen. QuSoft is the new Dutch research center for quantum software. Its mission is to develop new protocols, algorithms and applications that can be run on small and medium-sized prototypes of a quantum computer. The main focus of QuSoft is on the development of quantum software, which requires fundamentally different techniques and approaches from conventional software. QuSoft is a joint effort of CWI, UvA and VU University, and builds on the institutions’ excellent track record in quantum computing and quantum information.